Oh... how sweet. 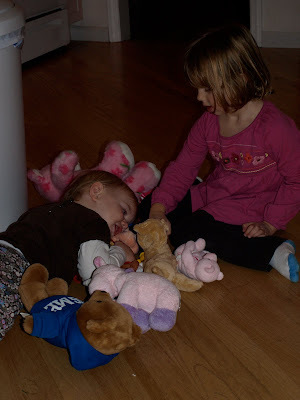 Ana taking a little break with a pile of stuffed animals. So cute. Wait. Um... what are you doing Zoe? And why is Ana laying on the floor right next to the garbage? And WHAT ARE YOU DOING??? EW! Oh wait. You''re both happy. And calm. And Mommy can sit and drink her coffee in a little peace and quiet? Go ahead with whatever you're doing. Bad Mommy will ignore the garbage and dirty floor for a minute (or 10). Sometimes you just have to focus on the happy and not the location of the happy.